Update: I’ll be posting about Itoi’s posts as they happen from now on, but I’ll also be archiving them all here for easy reference! 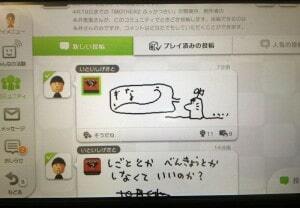 There’s also a separate sub-community page that features all of the Miiverse posts Shigesato Itoi is making. I assume he’ll be making them on a regular basis, so I’ll be updating with them on EB Central regularly too! That’s all he has posted for now. I did buy a Japanese Wii U last week, so I’ll be able to check out the Wii U version of MOTHER 2 when it comes out in a few days. Man, the next week or two’s gonna be crazy here! It’s really awesome that the American fans are posting on here, but unfortunately nobody’s gonna understand them since it’s a Japanese community. Oh well, hopefully some people will understand. *Cough* *cough* Itoi. *Cough* *cough* Nintendo. I’m really anxious to see if there really are any differences, like if there are any song replacements, it’ll be interesting to see if they added all-new songs or replaced them with existing ones. ^ lol sorry about that Buster. Let’s hope a lot of english responses do something! Really is a shame we aren’t apart of this. Fight the good fight people. We have to get EarthBound released on the VC. I’d love to join but sadly I don’t have a Wii U. This is really nice to see Mother fans from across the world discussing their love for the series. 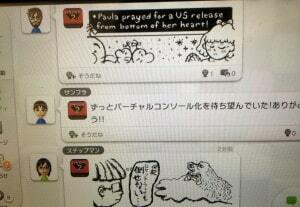 All the fan art looks really great, especially the picture of Paula praying for a US release. 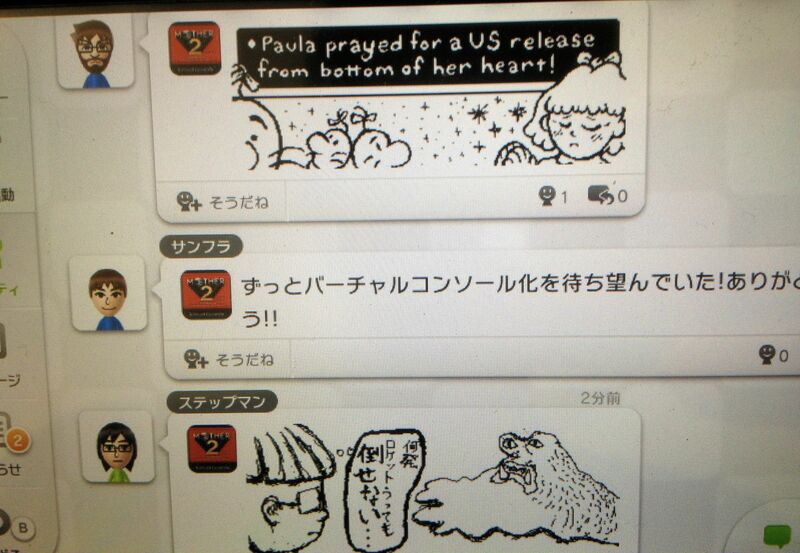 EarthBound/Mother fans from across the world prayed from the bottom of their hearts for a rerelease. >Are you having trouble today because you’re so attractive to others? I really wish I had this problem. I really do. Ugh, I’m insanely jealous. I truly hope this comes outside of Japan. Now we watch and wait. B) Can’t discuss much intil any game specific info for VC Mother 2 or any information regarding a hopeful release of Earthbound to the English speakers. 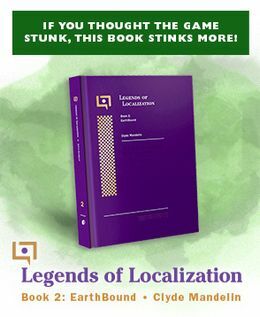 So, if I understand this correctly, we’re anxious for Nintendo to re-release EarthBound in the U.S. because the cartridges currently cost two-hundred-plus dollars. The remedy for this would be paying three-hundred-plus dollars to play it on a Wii U. I used to be in favor of this, but now I don’t see why. Well, a lot of people here are Nintendo fans who probably already have a Wii U. So the investment cost isn’t a big thing. Plus the Wii U can be used for more than just possibly EarthBound. 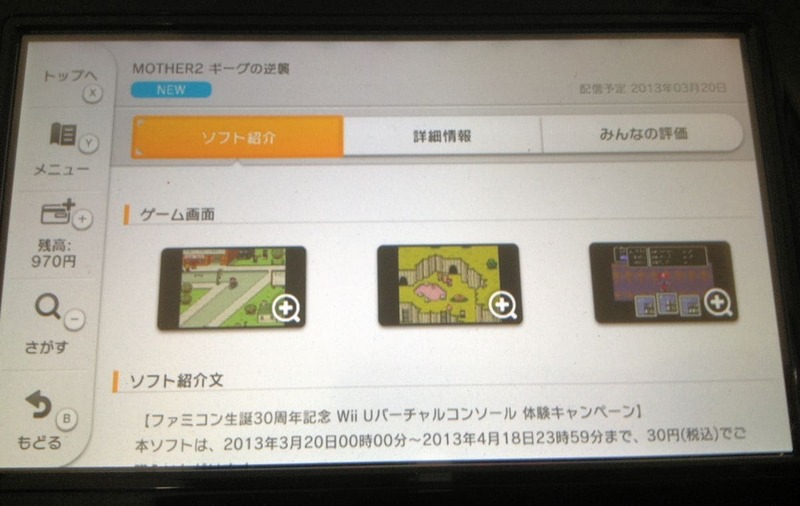 Actually, since I bought my Wii U a few months ago, I should be fine if EarthBound happens to be bound for Wii U. 3DS? That would be even better. Also, the Wii U will have some good games later, such as Lego City Undercover, Pikmin 3, Wonderful 101, Bayonetta 2, and that new RPG by Monolith Soft. There’s also NSMBU, Nintendo Land, Batman Arkham City, ME3, and more. Mato: That’s a completely legitimate point. I guess I’m just not a big enough Nintendo fan anymore. It doesn’t seem worth it to me (and I even own a Virtual Boy). 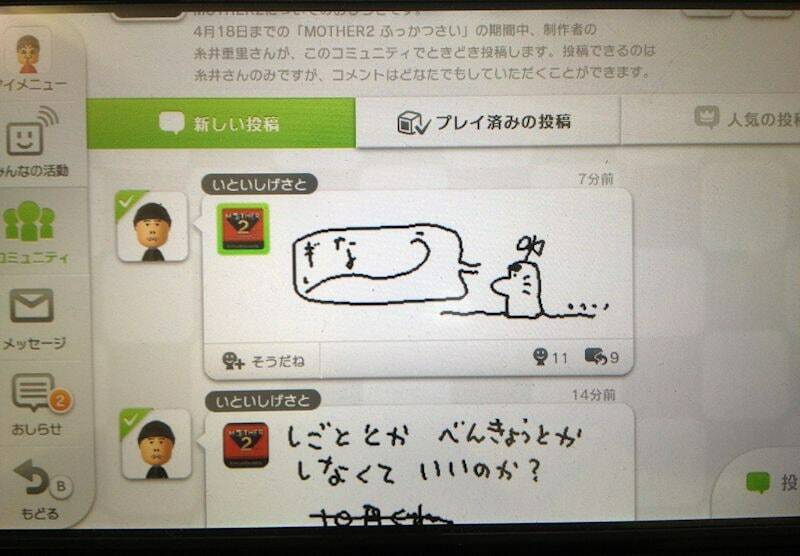 Well, since you can read japanse I hope you enjoy the Wii U. As stated, the Wii U has more functions than just for the sole purpose of getting Mother 2. Many will be interested to see if there are any changes to the game. I think you should play the game entirely before posting your findings. Earth Saturn: Yes, because nobody in Japan speaks English. And before you say anything, YES, I understand that the majority of learning is more vocabulary-based than actually learning how English works, but come on. How insular can you be to say that, essentially implying that you don’t believe that people for whom English is not their first language won’t be able to understand it? I applaud your dedication to the series by buying a Japanese Wii U, Mato. I can’t wait to hear if there’s been any changes made! wvlfpvp, That is true. English is pretty much a second language in Japan. But there are still a good number of Japanese people who don’t speak English. All that I meant to say was that there are a lot of people who won’t understand what the Americans are saying. I wonder how a VC release would affect the cartridge price? Ha ha, I love the stuff about the banana. Thanks for the translations, Mato. It’d be ironic if he mentioned a Tomato! I just want to say though that the chances are better than ever right now. Can’t wait to see what happens, and if MOTHER or MOTHER 3 get news. Fans from all over the world are converging on the miiverse? maybe if well all shout loud enough they will release the game over here. let’s do it. yeah we did it before and they didn’t listen, but let’s do it again anyway! What does the “gimme 10 yen” thing mean? It’s just a thing he started doing. He started with “Gimme something” during his original test post and then has been doing “gimme 10 yen” since. No one answered my question, I’m too lazy to Google, OMG WHEN IZ EARFFBOUWNZZ COMIN OUT IN JAPANZ??? ?